I’m the first to admit then when it comes to anything DIY I definitely get nervous. My mind starts racing and I start thinking of a gazillion ways to do something (or not do something) and then I end up chickening out. 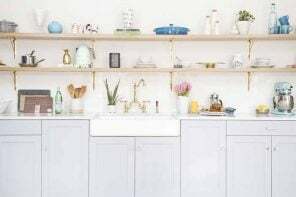 But what I’ve FINALLY realized the past couple years is that DIY is not as scary as I can sometimes make it out to be. Thinking about it as a creative process that can be whatever YOU want it to be has really made me come around to the idea of it…and guess what? I actually have FUN doing it! Which is exactly what happened with this shoot. 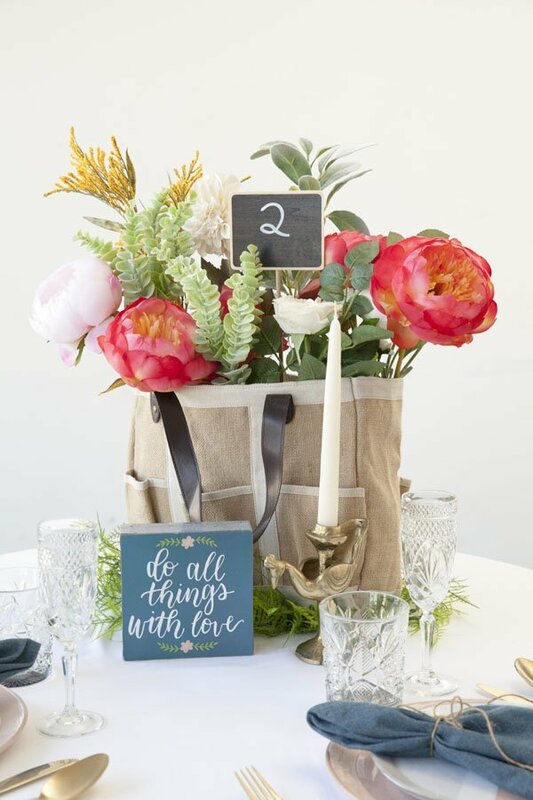 Looking for inspiration for unique wedding centerpiece, I went to JOANN (which, BTW, if you’ve never been to one before it will become your new obsession) with only a vague idea of what I wanted to do. 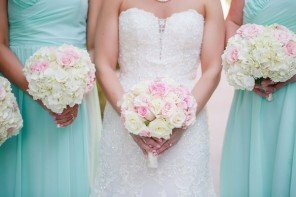 I knew I wanted to make something for all you spring and summer brides, but wasn’t sure quite what to do. The great news is I left there feeling completely inspired (I was like a kid in a candy shop, TBH. I couldn’t stop). 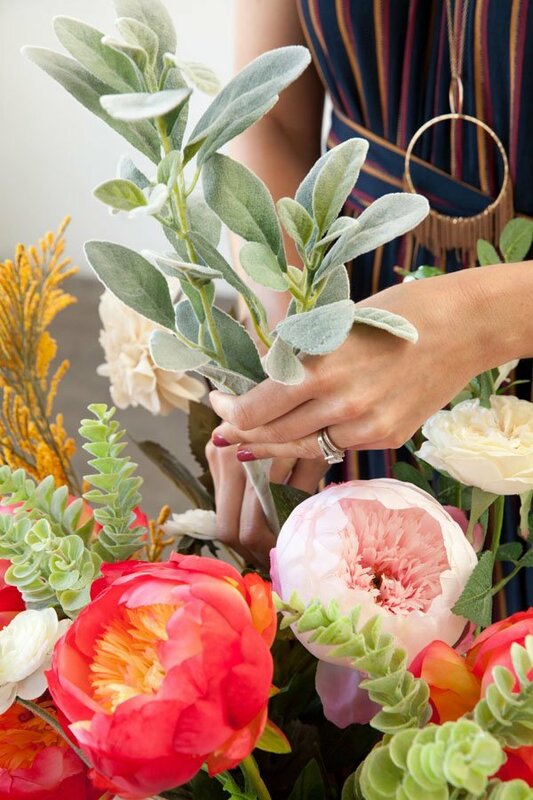 They just got a ton of spring and summer floral and accessories in, and along with their David Tutera wedding line I basically ended up with two shopping carts FULL of wedding centerpiece ideas (and more which you’ll see soon). 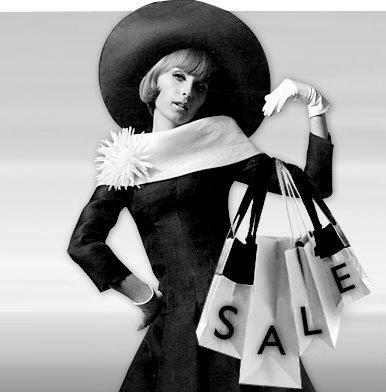 I would have probably filled another cart or two up but the words “restraint” and “budget” came to mind. LOL. I resisted, but not before buying what are, without a doubt, THE most gorgeous faux floral I’ve ever seen. 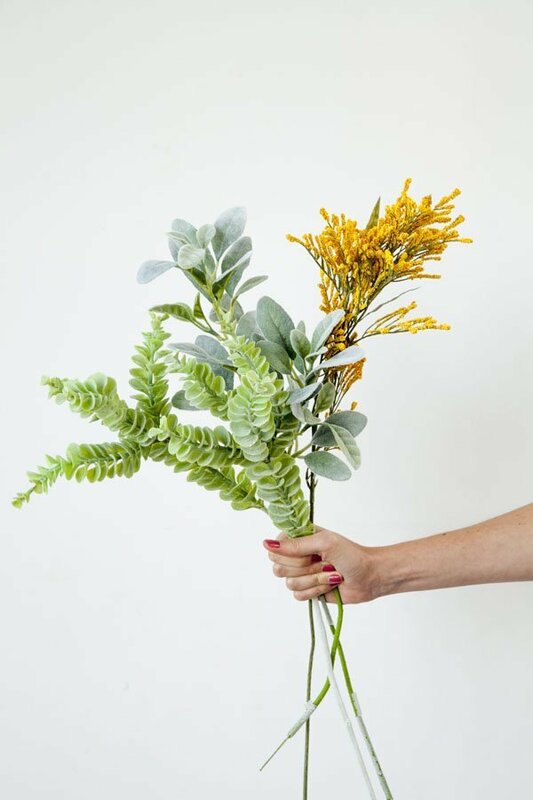 You have to seriously STARE at these flowers before you even begin to question if they are real or fake, and even then you might catch yourself smelling a few buds to test them out. They are that good!! 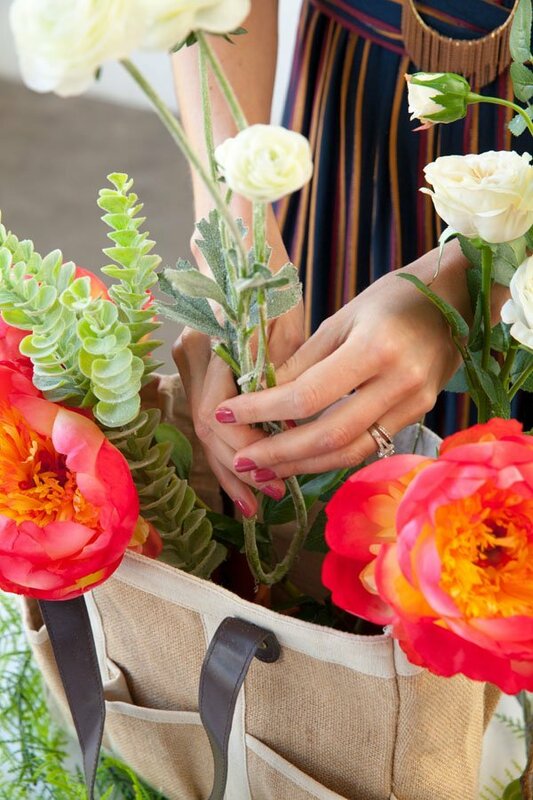 I needed a personal flower carrier by the time I left the store, but I had my inspiration and knew exactly where I wanted to start: the farmer’s market! 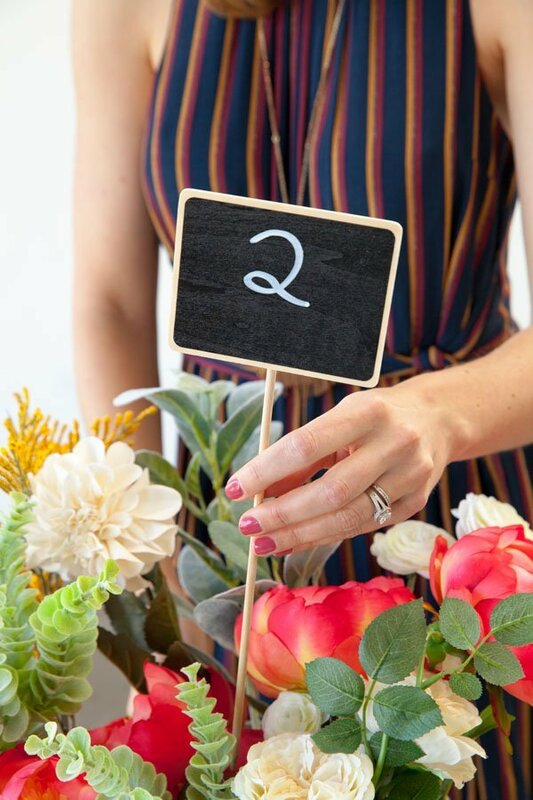 I live in Los Angeles where we have some of the best farmer’s markets in the country, and I’ve always thought it would be so great to incorporate that theme into a spring or summer wedding centerpiece. 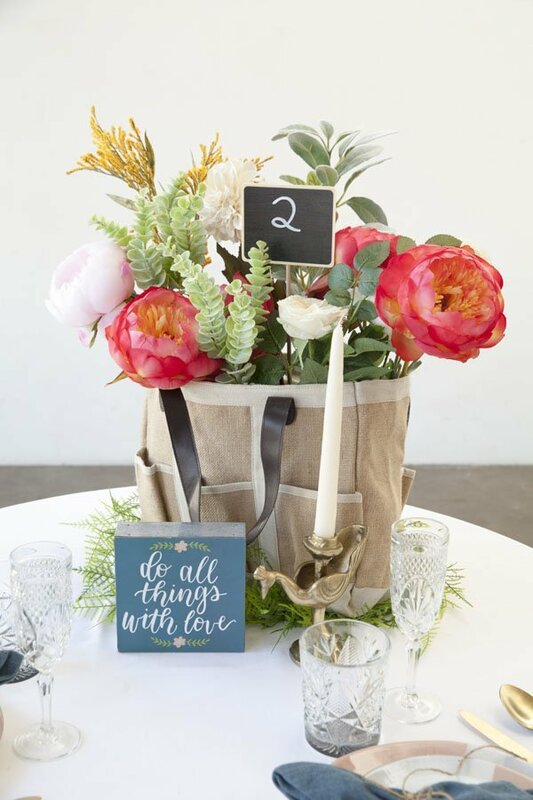 So when I went to JOANN and saw the gorgeous floral AND a super cute garden tote, the idea of combining the two for a fresh and unique wedding centerpiece came to mind. 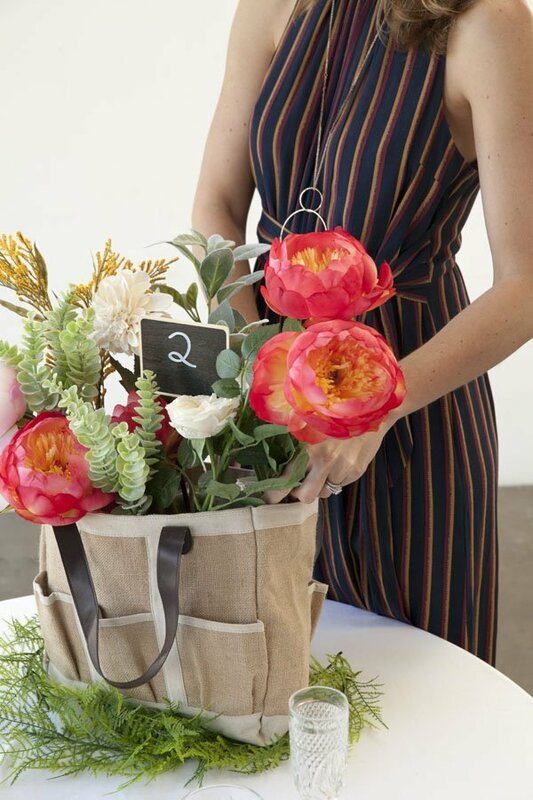 I just love walking around markets seeing the flowers and vegetables overflowing from tote bags, which was definitely the inspiration for our DIY wedding centerpiece, below. The best part? It was SUPER easy to put together. 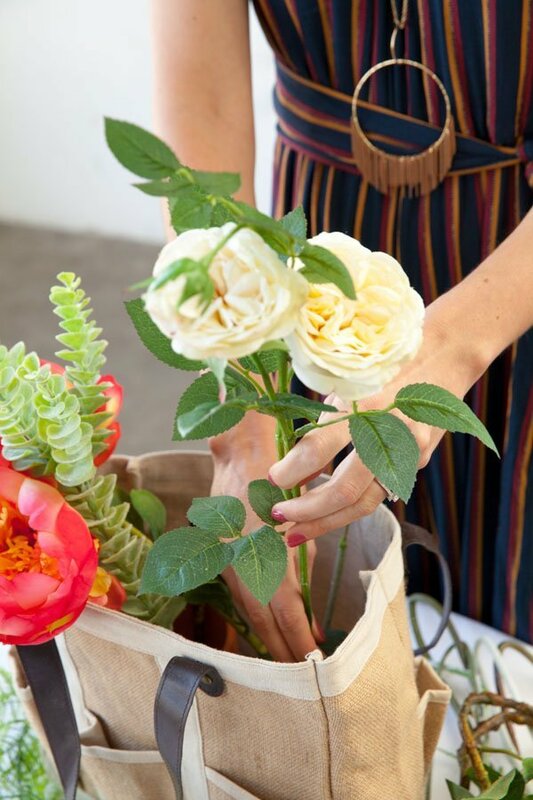 I’ve outlined the step-by-step process, below, but I basically took two ceramic pots and put them into the garden tote bag, then began bending the floral stems to the height I wanted and filling the pots and bag with various types of flowers until I got the look and fullness I wanted. We layed some extra greenery around the bag so it didn’t look too sparse, then put a great sign we found at JOANN (for under $5!) in front of it. 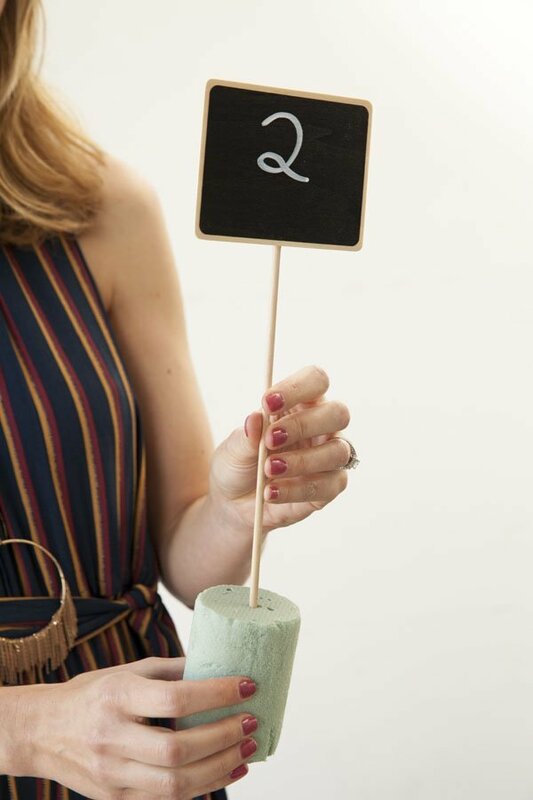 We topped it off with a David Tutera chalkboard stake table number that we used white paint pen on (though you could totally use chalk which we would actually recommend more in case you make a mistake) and that was it! Easy peasy!! And it took under 6 minutes! 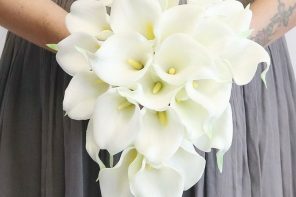 If you’re looking for a unique wedding centerpiece idea for a spring or summer wedding, this could be it. 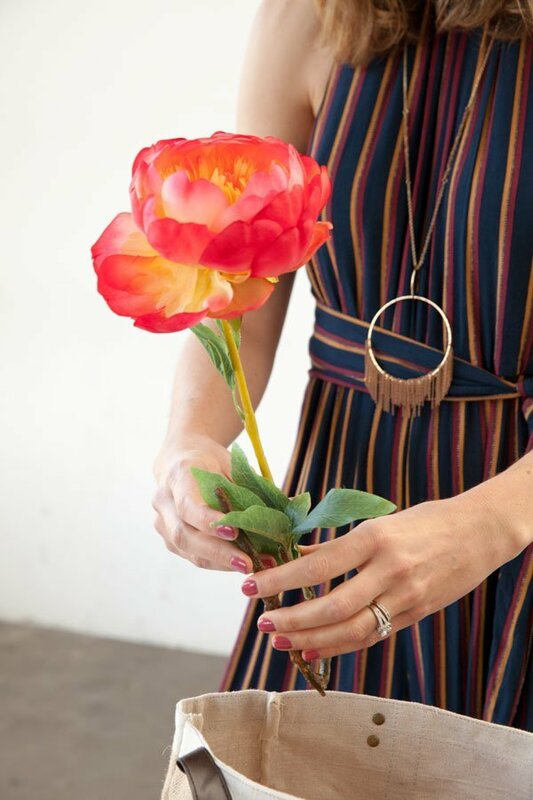 Read on to see what we did, and definitely check out JOANN in-store or online for even more DIY wedding inspiration. 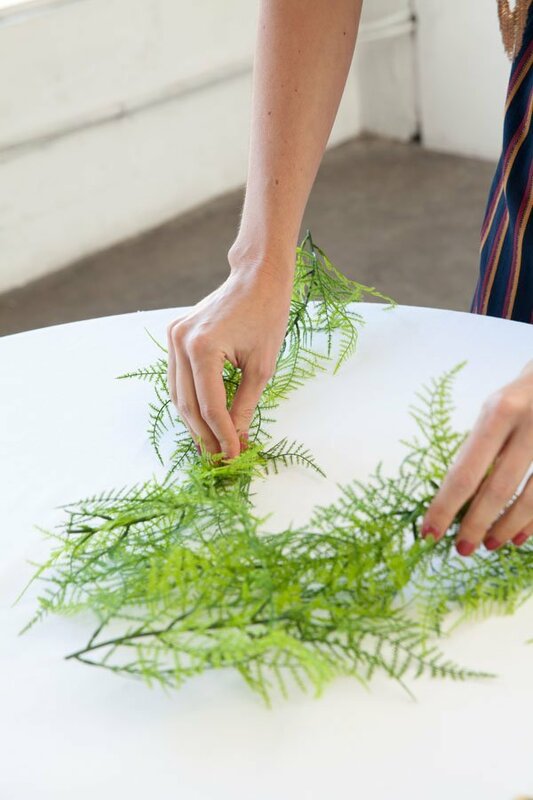 Step 1: Start by laying your greenery on the table followed by the tote. Re-arrange as needed. 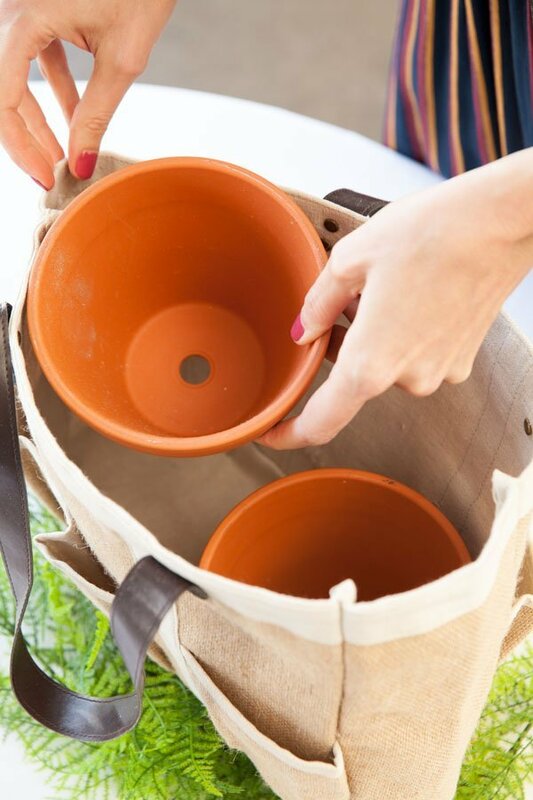 Step 2: Insert two, 6-inch ceramic pots (they’re great because they have a good amount of weight to hold the bag down). 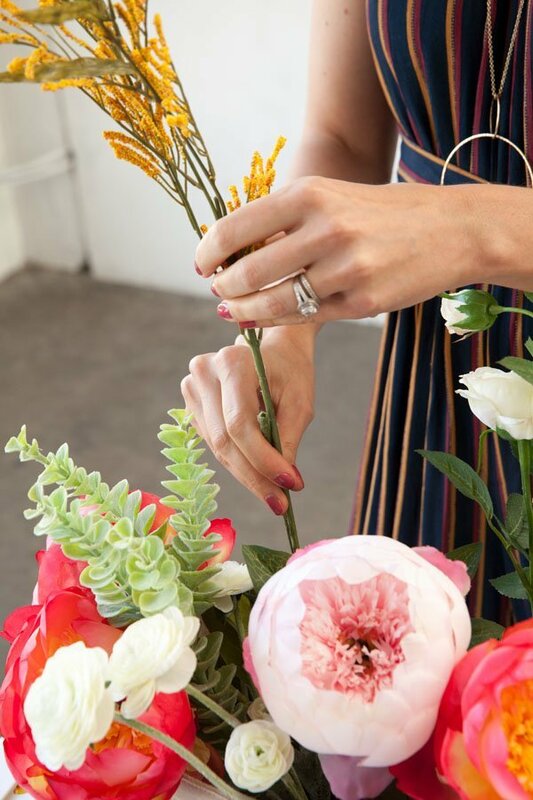 Next up…the flowers! 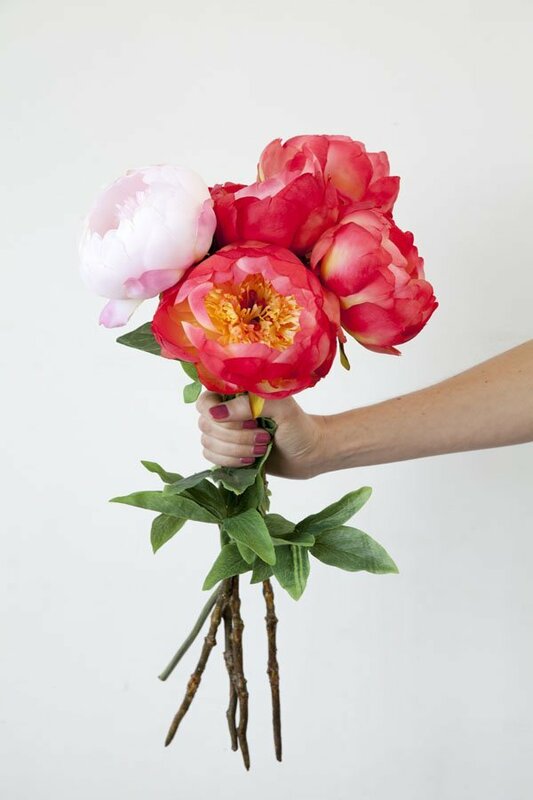 We started with peony sprays because they’re large and well, who doesn’t love a peony?! 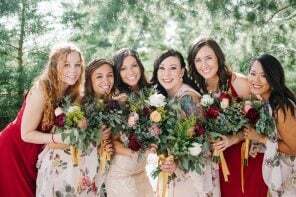 See all of the amazing JOANN wedding floral here. 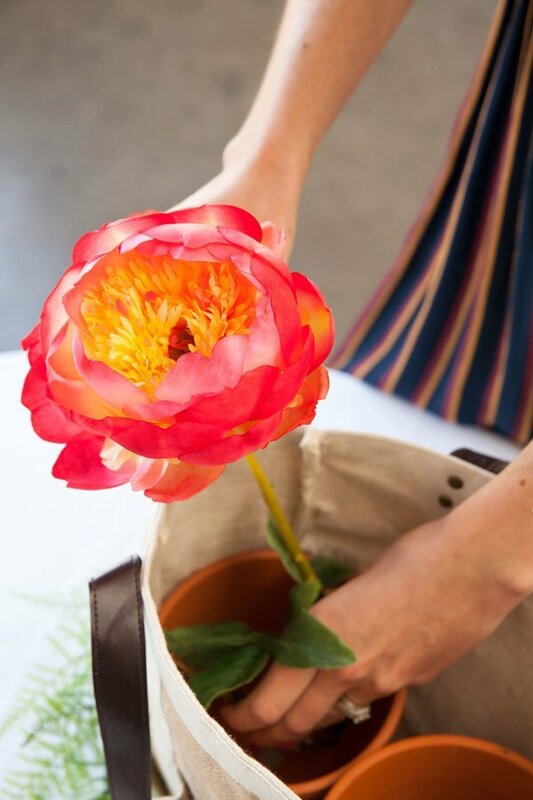 Step 3: We bent the stems about halfway (cutting these would be difficult since they’re very sturdy) then placed them one at a time into the pot, starting with the larger blooms (peonies) then moving on to filler like eucalyptus after the other blooms (like ranunculus) were in. 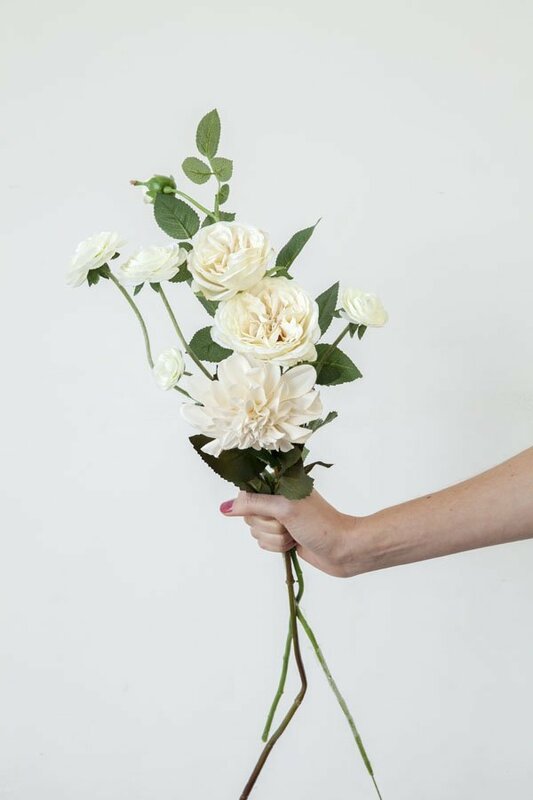 Ready to start your own wedding DIY? 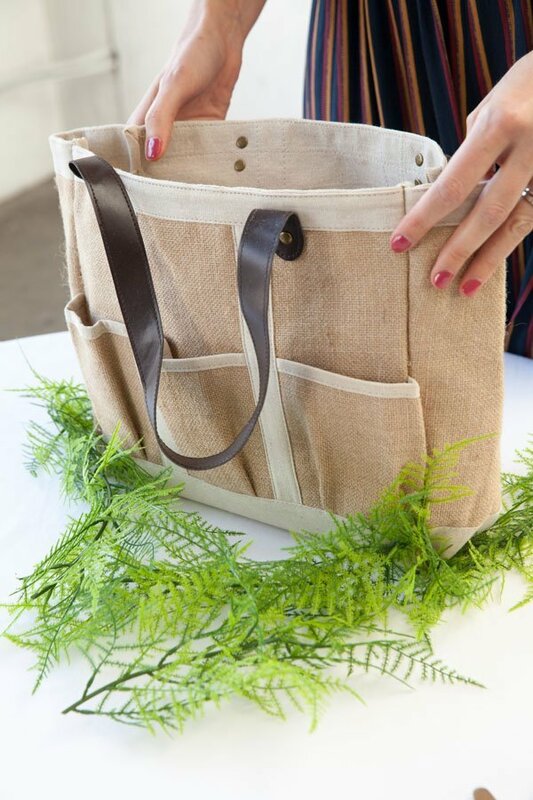 Check out the latest JOANN products here. 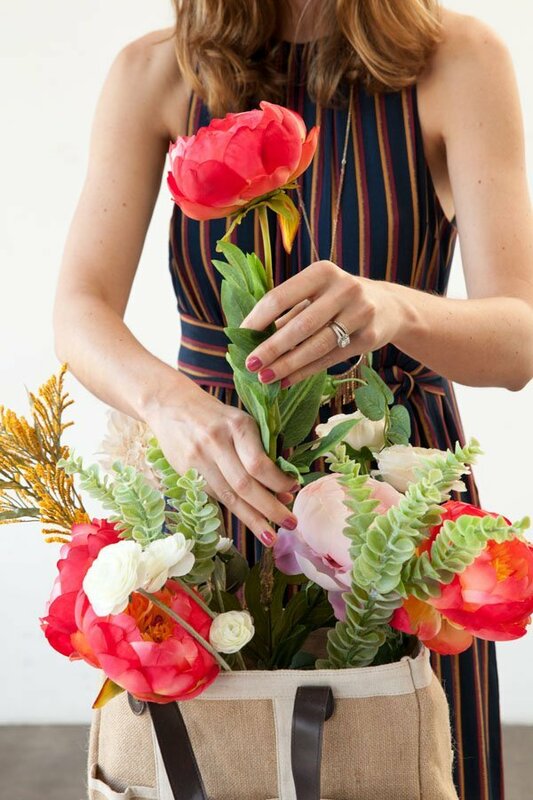 Step 4: Once you have a general idea of how you want it to look, go back and fill up more space as needed (we love how the peonies give you a TON of impact with just one stem). 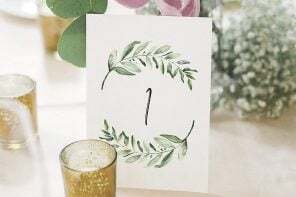 Step 5: Use chalk or a paint pen for each table number stake. 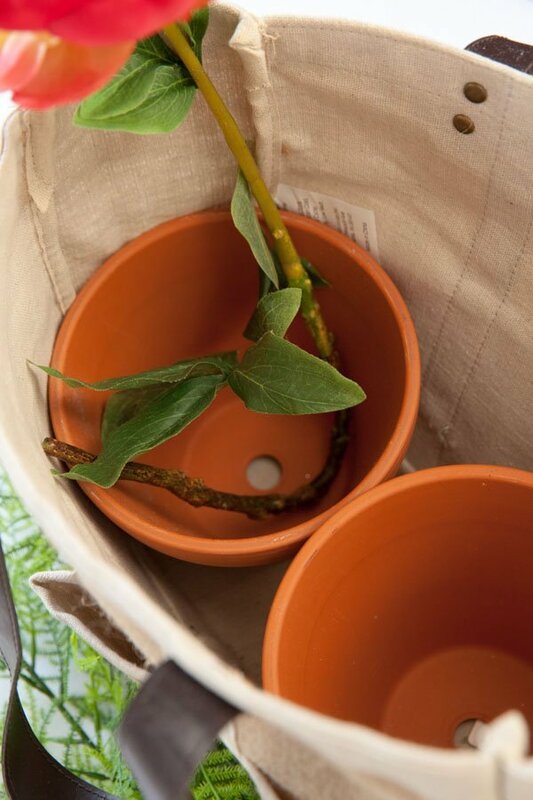 We then placed it in a round piece of floral foam and inserted that into the middle of the bag. 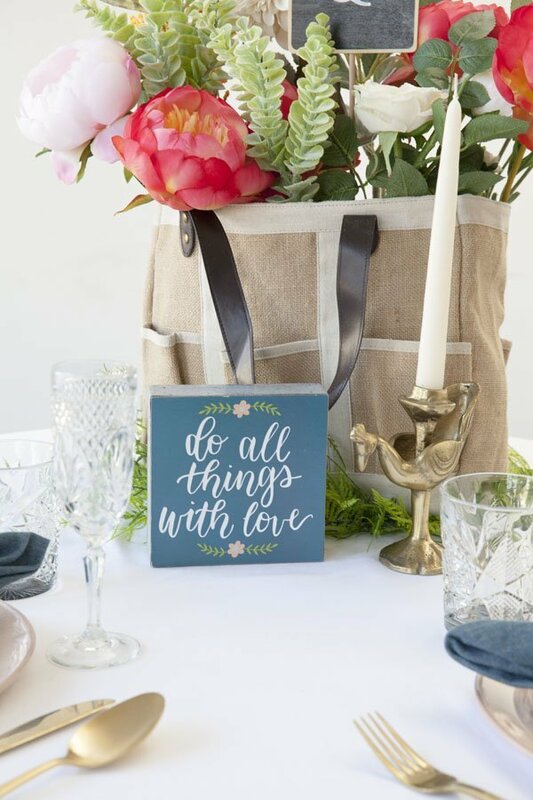 Check out more of our favorite DIY wedding essentials at JOANN. Step 6: Add a framed photo of the two of you or a sign (like this one) to round out the table. Step 7: And you’re done! 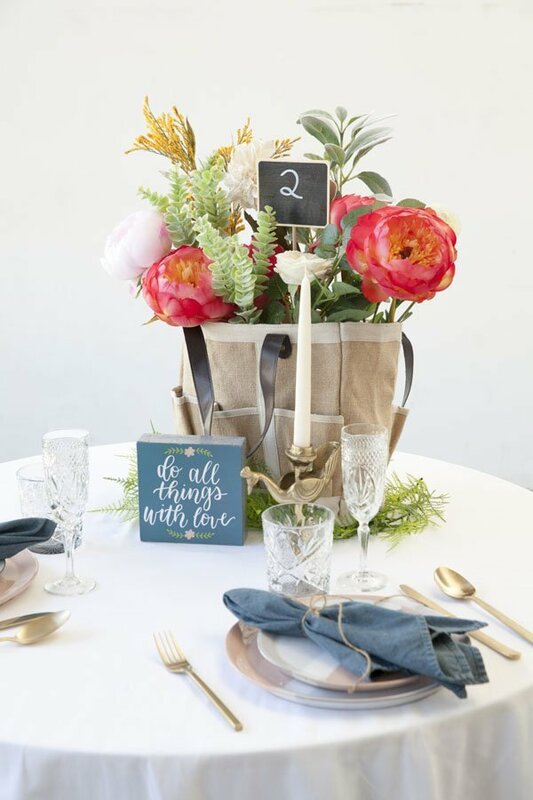 Our new favorite wedding centerpiece!